If you know anything about me, you probably know that I love a good floral cookie. It's kind of my go-to (because it's actually easier than it looks). Whichever way I can put a flower on a cookie, I have tried. Well, I thought I tried, until now. Actually, I have no idea what to call it, any ideas? Some people will call this technique brush embroidery. And I suppose that's probably how I should classify it. But I think of this technique more as painting with icing (as opposed to my usual watercolor mix). Whatever we call it, I certainly think they are pretty, don't you? Oh, and you can't forget about the little moss covered bunnies. Now those are easy! And just as cute, don't you think? 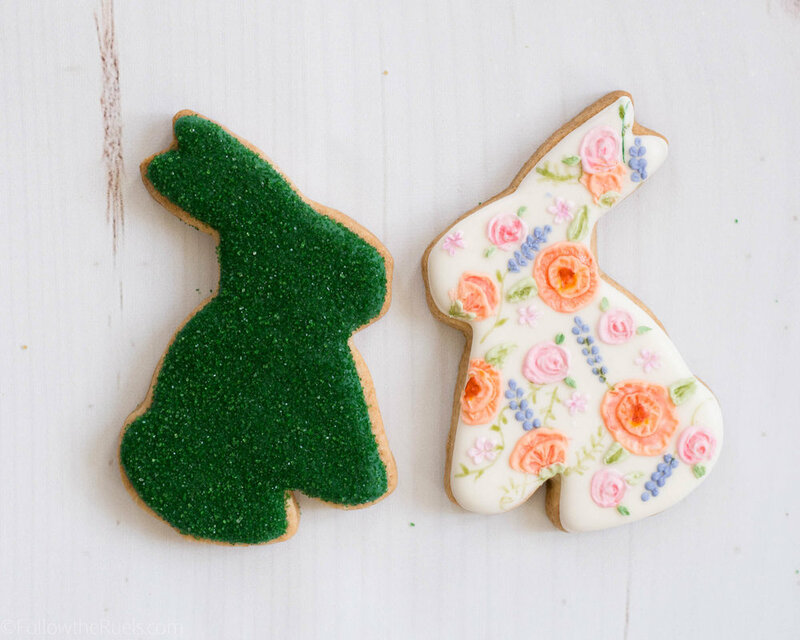 What I love about these floral Easter bunny cookies is that they have dimension. That is something that you just can't get with painting! My husband's favorite is the moss Easter bunny cookie. 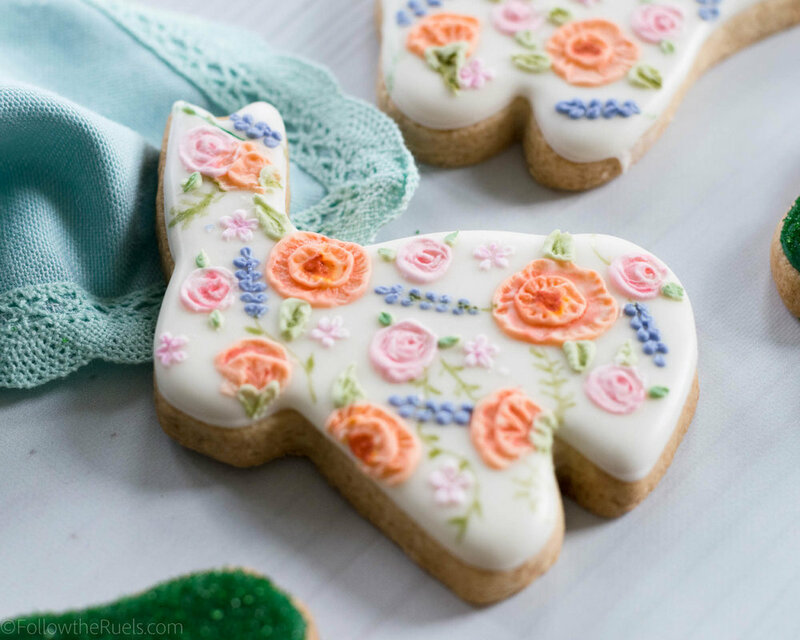 Even though it's simple, it still is adorable, and I think it goes perfectly with the floral design as sort of a little garden Easter bunny cookie set. Why I love the moss Easter bunny so much is because it's easy! While I love making the floral pattern, it is time-consuming, so it's nice to have some simple cookies to balance them out. But this little guy still has my heart! As usual, these sugar cookies are my favorite sugar cookies which means they are just flavored with vanilla and almond extract. But I think Easter is the perfect time to break out some other cookie flavors! Even just adding some different extracts like lemon, lavender, pistachio, or coconut. Or, you can flavor them with some of your favorite berries, like strawberry or raspberry. Just check out my Summer cookie collection. For the royal icing, I added a touch of almond extract, which is something I rarely do. But I really liked it. Another go-to in the Spring and Summer is adding some lemon juice or lemon extract. It really makes the flavors pop!